6x10 Wicker Polished Brass Floor Register Discounts Apply ! Brass air vents are now available in a unique wicker design. Your 6 x 10 floor register is protected with a lacquer topcoat finish to prevent corrosion. These brass air vents have a plastic damper so you can control the comfort level in every room. The 6 x 10 floor register has a steel core to provide strength where you need it. 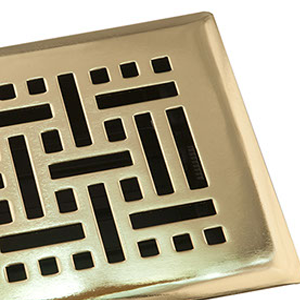 Polished brass air vents are a good choice for any style of home or decor. 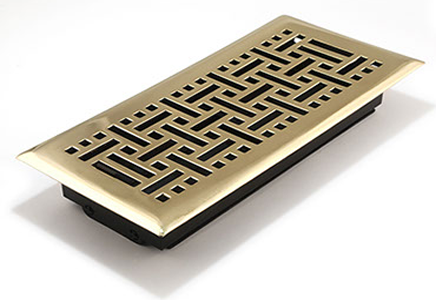 These brass air vents are perfect for your 6 x 10 floor register duct hole opening. ***Hint: The industry standard is to order brass air vents using the actual hole opening size and not the faceplate size. This 6 x 10 floor register will fit a 6 x 10 inch hole opening. 6 x 10 floor registers can be purchased in other finishes and a variety of sizes. Brass air vents in a wicker pattern, a new twist on a traditional finish. Order yours today!